Today, after this morning's rains ended, Blog Widow and I went to the Brooklyn Botanic Garden. It was my scheduled date to pickup my signature plant order: a pair of Paw-paws, and another native, unfamiliar to me: Meehania cordata. I shall be glad to make its acquaintance. The Garden was peaking today. Like the King in Amadeus, I wanted to declare, simply: "Too many colors." I didn't get to see everything I wanted today. The Rock Garden was also peaking, but I only got to walk past that on my way to the plant pickup area. But I got enough to satisfy my jones for the day. I've learned to carry deep photographic backup when I'm out on an excursion: two cameras, and two batteries for each. Today it paid off. The battery on my primary camera died just as I was taking the final shot for the panorama of the Cherry Esplanade. Got some perennial divisions or extra seed-starts you don't need? Looking to start a new garden, and want some free plants? Looking to meet your gardening neighbors and pick up some tips? 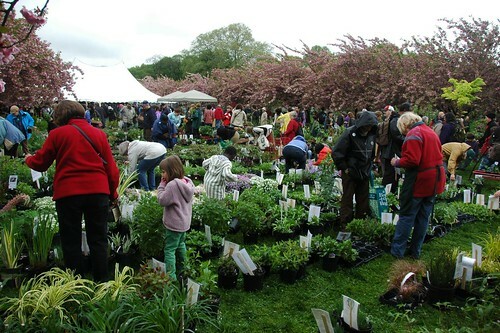 Not the most ideal weekend to be digging in the garden, but if you're lifting, removing or dividing perennials, or have extra seed-starts, bring them to the First Annual Great Flatbush Plant Swap next Saturday, April 24, in front of the Flatbush Food Co-Op. 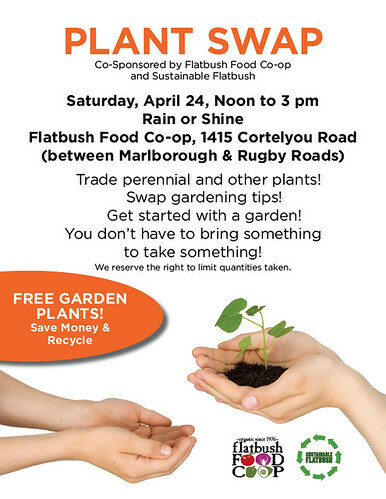 Co-sponsored by the Flatbush Food Co-op and Sustainable Flatbush, this is an opportunity to share or swap plants, meet your gardening neighbors, and get some free plants. 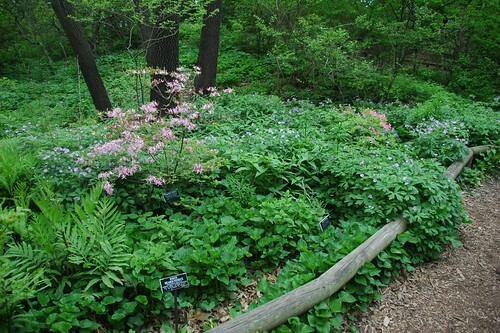 As one of the first public gardens to use the internet to connect with its constituents, Brooklyn Botanic Garden has been online since 1995. Over the years, our site has grown to thousands of pages of content. As the size of the site grew, its architecture made much of this valuable information increasingly difficult for staff to keep up-to-date and for visitors to navigate. We have now moved the site into a robust content management system, built using Expression Engine. We hope you enjoy our new format! If you have feedback on our new site, contact webmaster@bbg.org. 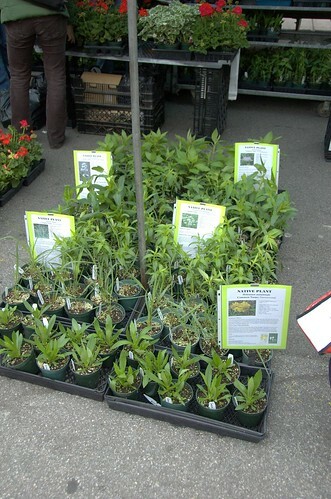 Local ecotypes - propagated from local sources by the Staten Island Greenbelt - for sale by Oak Grove Farms (now Nature's Healing Farm) at the Union Square Greenmarket during the first annual NYC Wildflower Week in 2008. I bought one of each; two years later, all are thriving in my backyard native plant garden. At least 50 varieties of native plants are locally extinct or nearing elimination, say project scientists. Nuttall’s mudflower (Micranthemum micranthemoides), last collected from the region in 1918, is likely extinct throughout its former range. Scarlet Indian paintbrush (Castilleja coccinea), pennywort (Obolaria virginica), sidebells wintergreen (Orthilia secunda), and sundial lupine (Lupinus perennis) are among the wildflower species to have seriously declined in the region. Black crowberry (Empetrum nigrum) is locally extinct, without a trace of a population remaining today in the New York City metropolitan area. 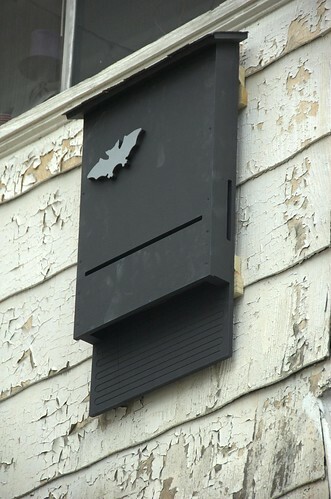 The story has been widely covered in blogs and other media, including New York Times Science. I've included the complete press release below for reference. I first wrote about NYMF in June of 2006, shortly after I launched this blog, four years ago next month. I've written about native plants countless times (see: Native Plant Profiles, Natives). I have a lifelong interest in the nature around me, especially that which is right around me, where I live. Learning about and understanding the ecosystems where I live is part of finding my place in the world. I come to feel this connection deeply. Without it, my life is impoverished, and I am lost. 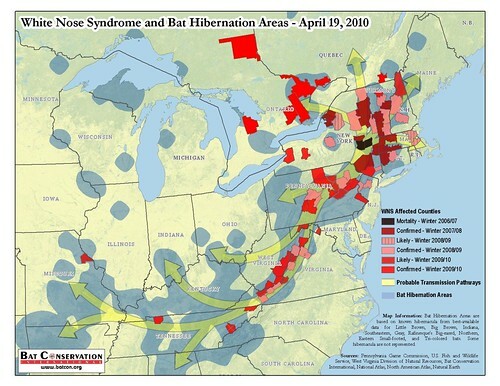 The greatest threat to native plants, and the ecosystems they support, is habitat loss. 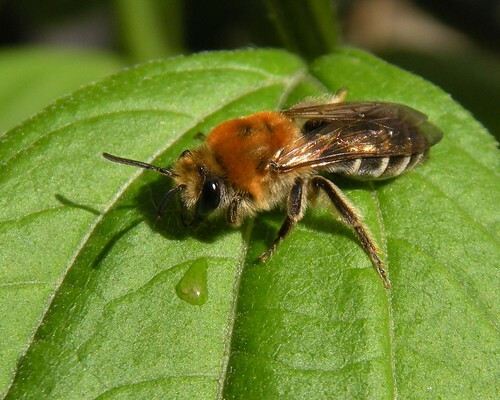 The second is competition and displacement, and further habitat loss, from invasive species, whether they be insects, infectious organisms, or other plants. Roughly half of invasive plant species were deliberately introduced, through agriculture, for civil engineering purposes such as erosion control, and for horticultural purposes. Once again, MillionTreesNYC is offering free trees, first-come, first-served, at limited locations around the city. Trees must be planted in the ground, not a container or planter, within New York City. They can be planted on private property, with permission of the property owner. Here are some Brooklyn locations. 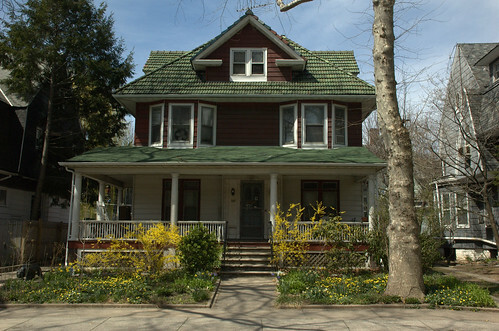 Check their Tree Giveaway page for the latest updates and other locations and dates around NYC. 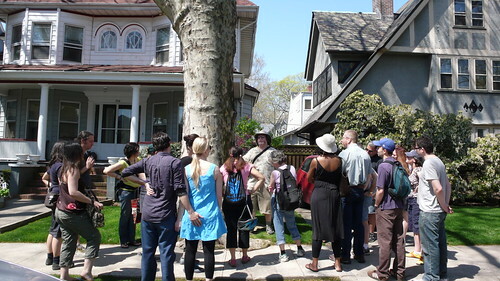 April is MillionTreesNYC month. In addition to the tree giveaway, there are many other events and activities scheduled. Due to circumstance and inclination, my three decades of urban gardening have been devoted to mostly ornamental private gardens. I have dabbled in the occasional strawberry jar potted up with herbs (successful) and sweet corn in container (wretched). Nevertheless, most of my experience is with perennials and bulbs. I label my plants. Rather, I label where I plant them. This is most helpful in the off seasons, to dissuade me from scanning some patch of deceivingly barren soil and imagining all the new plants I could acquire to populate it. In the first garden, in the East Village, I carefully labeled all the little bulbs and plants with plastic labels. 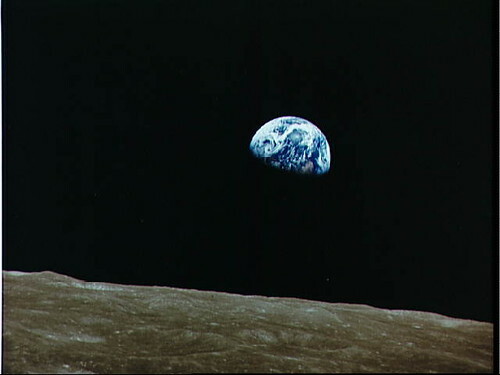 The white plastic contrasted strongly with the dark earth. This led one visitor to describe it as a "plant cemetery." I've since graduated to aluminum labels. They are durable, erasable and reusable. Perhaps most important, less conspicuous. 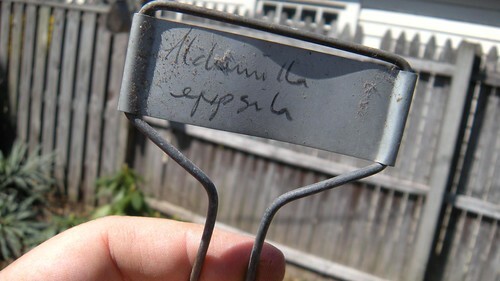 I've also gotten into the habit of scribing the provenance onto the back of the label: the year, and usually also the source from which I purchased the plant. Nevertheless, they sometimes still serve as markers for those plants that have passed on. This is so common that gardeners have a euphemism for it: "adventurous." I am an adventurous gardener, in that I will plant things I've never grown before, perhaps never ever heard of before reading about it or spying it in some nursery and "rescuing" it. Here then is a sampling of The Fallen, transcribed from markers I've found in different stashes, collecting dust with years-old seed packets, rusting pruners, and forgotten catalogs. 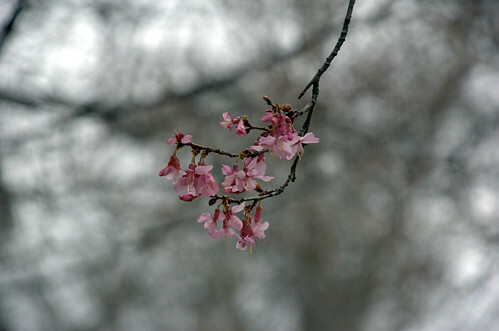 From April 3 to May 2, Brooklyn Botanic Garden (BBG) celebrates Hanami, the Japanese cultural tradition of viewing each moment of the cherry blossom season, from the first buds to the pink blossoms that fall like snow. During Hanami, visitors can take a free Seasonal Highlights Tour (Saturdays and Sundays at 1 p.m.) focusing on the ethereal beauty of BBG’s Japanese plant collections and specialty gardens, including the more than 220 exquisite flowering cherries, the C.V. Starr Bonsai Museum, and the Tree Peony Collection. Brooklyn Botanic Garden’s curator of the Japanese Hill-and-Pond Garden, Brian Funk, will also host a Meet the Curator session (Wednesday, April 14, at 4 p.m.). Throughout Hanami, the cherry display will be tracked in real time on BBG’s web-based CherryWatch feature, which maps the entire collection and provides daily blossom updates. The four weeks of Hanami culminate in the Garden’s legendary two-day festival Sakura Matsuri — popularly referred to as “New York’s rite of spring” — a thrilling tribute to the Garden’s iconic collection of flowering cherries. Sakura Matsuri is scheduled for May 1 and 2, from 10 a.m. to 7 p.m. each day, with over 60 performances, demonstrations, and exhibits—many of which are new and specially commissioned for the dynamic weekend celebration. Visitors of all ages are welcome to Sakura Matsuri, the nation’s largest event in a public garden.